As a software engineer and part of Analytics and Machine Learning team at Searce, I tried to build a project with Tensorflow-GPU and NVIDIA CUDA configured VM instance on Google Cloud Platform. During the setup, I faced many challenges and I couldn’t find a proper source which consolidates each step to achieve the goal. So, here I am writing this post which will describe each step in detail. I hope this will be helpful to those who tried something similar on GCP. 1. 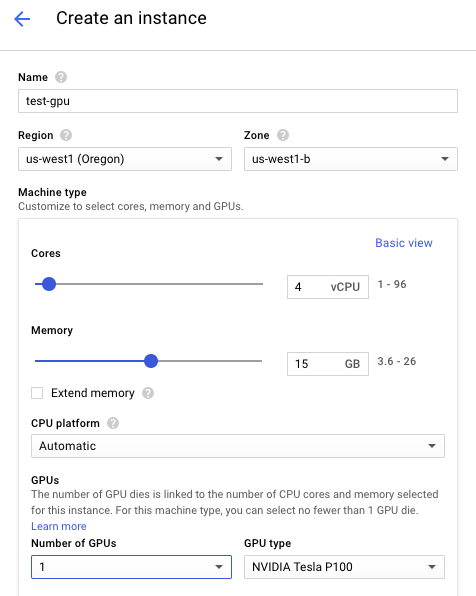 Setup a Google Cloud Instance: Create an instance with your choice of name and region(Although not all regions provide GPUs).I have chosen us-west1 as region. In machine type, select 4 vCPUs. Customise your machine type by selecting number of GPUs. In Boot Disk option, change OS image to Ubuntu16.04 LTS. You can increase the Boot Disk size also. By default, it’s 10 GB. I have increased it to 50 GB.Allow HTTP and HTTPS traffic for your instance.After that click on Management, disks, networking, SSH keys option. You need to add the startup script which will automatically download the required NVIDIA GPU drivers for the graphics card. The latest version of the script can be found here or you can type “gpu script” in help option in GCP console itself. Select script for ubuntu-16.04 LTS and CUDA-9. Paste the following script in Startup Script option.You can either add this script in Startup Script option or install CUDA drivers from the site but I recommend to use the following script. 2. Connecting to SSH Server : Once the instance is set up, hit the SSH button to connect with SSH server. To stay up-to-date with the SSH server, hit the command. Once it’s done, you can go to the official Tensorflow site for GPU installation. The 1st and 2nd instructions are already satisfied in our case. To get the copy of cuDNN library for CUDA, we are required to get NVIDIA membership. You can become a NVIDIA developer for free using their official website. Once you are done, you need to download a proper version of cuDNN for your instance. You are given different options for different operating system. In our case, we will be using cuDNN v7.1.4 Library for Linux. This is the most important step as there are many dependencies on this cuDNN version. This cuDNN version is for CUDA 9.0 version. To check whether the file is uploaded to a proper destination, use ls command. You should be able to find .tar file. To unpack this file, use the following command. Once the file is unpacked, use the following command to copy this to cuda directory. 4. Installing all necessary python packages: While cuDNN library is getting downloaded, we can install all necessary python packages which might be used in future. 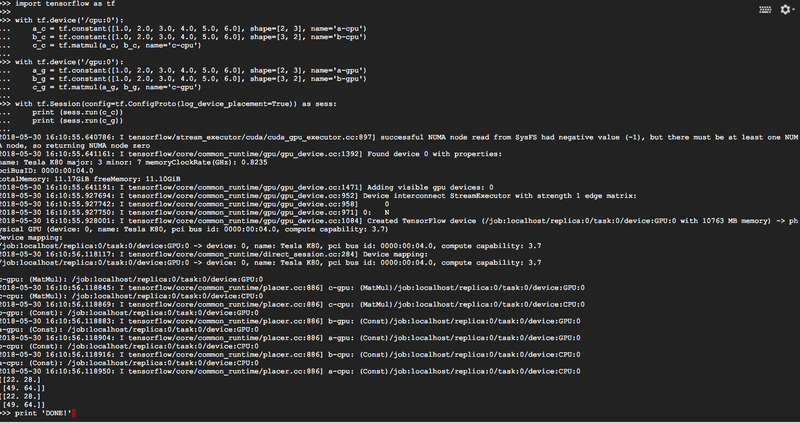 Install ipython and pip using following commands.Press ‘y’ for each yes/no question to install. Make sure that you are getting pip for python3. Some more python packages which I will be using in future are numpy, pandas, scipy. You can install these packages according to your need but I recommend to install the basic python packages. Use following command to install. It may take some time to install all these packages. Meanwhile, you can read more about NVIDIA cuDNN library and its features here. After installing all above packages, run the following command. This command is required because we will be using Tensorflow from the source. Add these two following lines of code, to make sure that our VM instance knows where the CUDA file is which we uploaded and unpacked in the previous step. Then, use the source command to reload the file. Now, we are adding repository of bazel for google cloud apis. 5. Install Tensorflow on instance : Now, clone Tensorflow’s git directory to your instance using following command. It will install the latest version of tensorflow. Now, run the following commands in this particular sequence. After running this command, press enter until you get to “Please input the desired Python library path to use”. Hit the following command. Press enter until you get to “Do you wish to build TensorFlow with CUDA support?” Press ‘y’ as a reply and hit enter.Then, run these following commands to copy the files to the tensorflow temp folder. Once the commands for bazel file are implemented successfully, run the following command and exit the SSH window. Now, Again connect to SSH server window and try out the following code to check if the GPU is set and being utilised.Type python3.It will open python interpreter and implement the following code. If you get the similar output then you have setup the GPU successfully and you are done!!! Thank you for reading this and I hope you installed CUDA successfully on your VM instance for your next super-duper next-gen project. Feel free to check out more interesting articles on our Searce Engineering Blog.